Chlorine is often added to irrigation water to oxidize and destroy biological microorganisms such as algae, fungi, and bacteria. While these microorganisms may be present in water from any source, they are most likely to exist at high levels in surface. Irrigation water from rivers, canals, reservoirs, and ponds. When water containing high levels of microorganisms is introduced into a microirrigation system, it may clog the emitters. Using a good filter (such as a sand media filter) and acidifying the water can cut down on organic clogging, but some organic material will pass through the filter into the drip lines. Thus, chlorination or some other biocide usually will be needed to prevent clogging from organic material. Common sources of chlorine are chlorine gas, sodium hypochlorite (a liquid), and calcium hypochlorite (a powder or granules). Adding chlorine to water produces mainly hypochlorous acid and hypochlorite, both referred to collectively as free available chlorine. Hypochlorous acid is the most effective agent for controlling biological growths. Its concentration depends on the pH of the water. Maintaining a pH of 7 or less means that at least 75% of the chlorine in the water is hypochlorous acid, while at a pH of 8 only about 25% of the chlorine is hypochlorous acid. At a pH of less than 3, chlorine gas predominates. IR = the injection rate in pounds per day (the most common unit used for chlorine gas injection systems). C = the desired chlorine concentration in the water in parts per million (ppm). Sodium hypochlorite (liquid bleach) is usually available with up to 15% available chlorine. Household bleach is sodium hypochlorite with 5.25% available chlorine. Most liquid fertilizer injection equipment is capable of injecting liquid chlorine. If the injection point is downstream of the filters, it may be necessary to hand treat the filters with chlorine. Adding sodium hypochlorite to water produces hydroxyl ions, which raises the pH of the water and in doing so may decrease the effectiveness of chlorination. 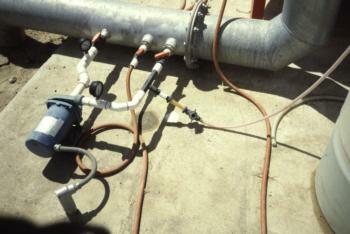 Acid injection may be necessary to reduce the pH and increase the chlorine's effectiveness. Do not mix chlorine and acids together because that can cause the formation of chlorine gas, which is highly toxic. Use different storage tank and injection ports for acid and chlorine. Q = the era geisha and system flow rate in gallons per minute (gpm). S = the strength of the sodium hypochlorite source expressed as a percentage. Sufficient household bleach (5.25% chlorine) is to be injected into a drip irrigation system with a flow rate of 500 gpm so that the final chlorine concentration in the irrigation water is 5 ppm. What should the bleach injection rate be? Calcium hypochlorite normally contains 65 to 70% available chlorine. Note that 12.8 pounds of calcium hypochlorite dissolved in 100 gallons of water forms a 1% chlorine solution. A 2% chlorine solution therefore requires adding 25.6 pounds of calcium hypochlorite to 100 gallons of water. Any chlorine stock solution can be mixed following the same pattern. The equation used for sodium hypochlorite injection rates can be used for the calcium hypochlorite solution once the percent concentration stock solution is determined. Use caution when dissolving calcium hypochlorite in water because of the possible formation of chlorine gas. Continuous injection of chlorine should be used if the irrigation water has high levels of algae and bacteria. The recommended level of free chlorine is 1 to 2 ppm at the end of the irrigation system. It is important to check the concentration at the end of the lateral line since chlorine is consumed when it reacts with organic constituents and any iron and manganese in the water. The chlorine concentration can be determined with a good quality swimming pool or spa chlorine test. Periodic (e.g. once per month) injections at a higher chlorine concentration rate (10 to 20 ppm) for 2 hours or more may be appropriate where algae and bacterial slimes are less of a problem. The frequency of injection depends on the potential organic clogging. Super-chlorination (injecting chlorine at high concentrations) is recommended for reclaiming drip irrigation systems clogged by algae and bacterial slimes. Super-chlorination requires special care to avoid damage to plants and irrigation equipment.